Beautiful autumn weather. Even when the temperature starts dropping into single digits. We can’t complain, we had a long summer for a change. It’s been a while again since I was out on a bike. Not true, I bike to work 3 days a week. But out in the forest. My master plan I had in the beginning of the year … to make a bit more time available in the weekends to go riding in the forests around town with some friends. Something we did more than once a week a couple of years ago. That era in time before we had kids. The forest was OK for most of it. Some of it was very, very, very muddy. No pics of that because I was struggling with getting my bike AND myself out of it. And slippery on the rocks. Now, this shot doesn’t look too steep, but this is only the last 10% of it. Which we walked, yes, I am not ashamed of it. Can’t wait till next time!!! Yesterday I was at home with the kids. Zeb got a fever (39º) the night before, so we decided to keep him and Milla at home. The morning was filled with moving some boxes and other stuff out of the way, hanging up a some frames safely (so they don’t fall down with the slightest touch),… Going outside was out of the question because it looked like it would rain any minute. And Zeb wouldn’t have enjoyed it anyway. Eventually he fell asleep, slept for3 hours and woke up a new person. Even the weather looked good all of the sudden. So we ate and packed a few things to head outside. Off to the lake just by the edge of our area. Doesn’t it look wonderful ? Behind me kids were jumping in the water. I think Milla and Zeb wanted as well, but I didn’t bring towels. 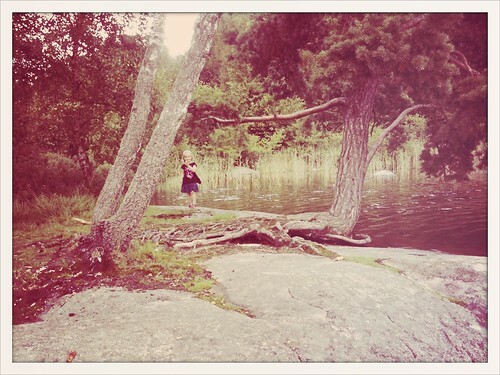 We walked around the whole lake, looked for places where we could swim. Which means almost everywhere. Maybe next weekend or so, because the water is still warm there. Eventually, the weather turned on us. But a forest means loads of trees to hide under. And it cleared again before we left it. I think the kids loved it. Loads of exploring to do in the future. It just feels fantastic to have a place like this within walking distance from the house.